Amitabh Chak, MD, of University Hospitals Case Medical Center’s Seidman Cancer Center and Case Western Reserve University School of Medicine, presented findings today at Digestive Disease Week in Chicago in a research forum titled “Aberrant Vimentin Methylation in Esophageal Brushings: A Biomarker for Detecting Barrett’s Esophagus and Esophageal Adenocarcinoma” (embargoed May 5, 9:15 am CT). Dr. Chak and a research team found that a change in the DNA, methylation of the vimentin gene, can be an effective new less-invasive test for detecting Barrett’s esophagus (BE). In 117 patients, they examined if a new, non-endoscopic “brushing” of the esophagus is as effective as the more invasive, traditional biopsy. The research builds upon previous work by the team that aberrant vimentin methylation is a highly common epigenetic alteration in neoplasia of the upper gastrointestinal tract. In this study, they analyzed esophageal specimens in patients with BE, esophageal cancer as well as control subjects. The data determined that methylated vimentin is a highly sensitive biomarker for Barrett’s esophagus and that the less invasive brushing technique can effectively detect these changes in the DNA. The study is funded through the Barrett’s Esophagus Translational Research Network (BETRNet), a $5.4 million grant to Case Western Reserve University School of Medicine. The five-year award supports a research team, led by Dr. Chak, collaborating to develop an understanding of the basis of Barrett’s esophagus and its conversion to esophageal carcinoma through genetic, molecular and physiologic studies. The study is collaborative with the National Cancer Institute’s Specialized Program of Research Excellence (SPORE) in Gastrointestinal (GI) Cancers award to the School of Medicine. The $11.3 million SPORE grant, led by Sanford Markowitz, MD, focuses on translational research aimed at reducing the incidence and deaths from colon and esophageal cancers. The study is additionally supported by the NCI’s Early Detection Research Network (EDRN) program that is also led by Dr. Markowitz, and is supported by a $1.5 million NCI grant to Case Western Reserve. The emergence of in vivo cancer biomarkers is promising tool for early detection, risk stratification, and therapeutic intervention in the esophagus, where adenocarcinoma is increasing at a rate that is faster than any other in industrialized nations. Exciting advances in target identification, probe development, and optical instrumentation are creating tremendous new opportunities for advancing techniques of molecular imaging. Progress in these areas is being made with small animal models of esophageal cancer using surgical approaches to induce reflux of acid and bile, and these findings are beginning to be evaluated in the clinic. Further identification of relevant targets, characterization of specific probes, and development of endoscopic imaging technologies are needed to further this direction in the field of molecular medicine. In the future, new methods that use in vivo cancer biomarkers for the early detection of neoplastic changes in the setting of Barrett’s esophagus will become available. 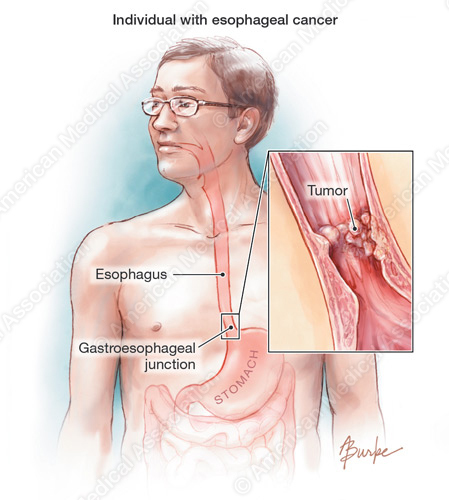 The aberrant DNA methylation of tumor suppressor genes is well documented in esophageal cancer, including adenocarcinoma (EAC) and squamous cell carcinoma (ESCC) as well as in Barrett’s esophagus (BE), a pre-malignant condition that is associated with chronic acid reflux. BE is a well-recognized risk factor for the development of EAC, and consequently the standard of care is for individuals with BE to be placed in endoscopic surveillance programs aimed at detecting early histologic changes that associate with an increased risk of developing EAC. Yet because the absolute risk of EAC in individuals with BE is minimal, a clinical need in the management of BE is the identification of additional risk markers that will indicate individuals who are at a significant absolute risk of EAC so that they may be subjected to more intensive surveillance. The best currently available risk marker is the degree of dysplasia in endoscopic biopsies from the esophagus; however, this marker is suboptimal for a variety of reasons. To date, there are no molecular biomarkers that have been translated to widespread clinical practice. The search for biomarkers, including hypermethylated genes, for either the diagnosis of BE, EAC, or ESCC or for risk stratification for the development of EAC in those with BE is currently an area of active research. In this review, we summarize the status of identified candidate epigenetic biomarkers for BE, EAC, and ESCC. Most of these aberrantly methylated genes have been described in the context of early detection or diagnostic markers; others might prove useful for estimating prognosis or predicting response to treatment. Finally, special attention will be paid to some of the challenges that must be overcome in order to develop clinically useful esophageal cancer biomarkers. University Hospitals, the second largest employer in Northeast Ohio, serves the needs of patients through an integrated network of hospitals, outpatient centers and primary care physicians in 16 counties. At the core of our health system is University Hospitals Case Medical Center, one of only 18 hospitals in the country to have been named to U.S. News & World Report’s most exclusive rankings list: the Best Hospitals 2013-14 Honor Roll. The primary affiliate of Case Western Reserve University School of Medicine, UH Case Medical Center is home to some of the most prestigious clinical and research centers of excellence in the nation and the world, including cancer, pediatrics, women’s health, orthopaedics and spine, radiology and radiation oncology, neurosurgery and neuroscience, cardiology and cardiovascular surgery, organ transplantation and human genetics. Its main campus includes the internationally celebrated UH Rainbow Babies & Children’s Hospital, ranked among the top children’s hospitals in the nation; UH MacDonald Women’s Hospital, Ohio’s only hospital for women; and UH Seidman Cancer Center, part of the NCI-designated Case Comprehensive Cancer Center at Case Western Reserve University. UH Case Medical Center is the 2012 recipient of the American Hospital Association - McKesson Quest for Quality Prize for its leadership and innovation in quality improvement and safety.